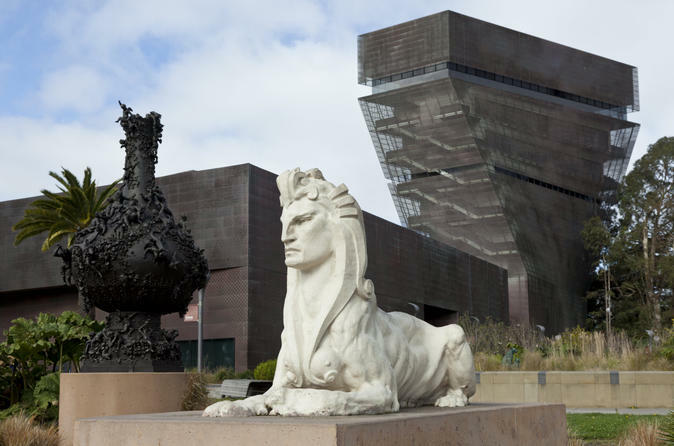 Explore one of San Francisco’s most distinguished art collections at the de Young Museum, situated in lovely Golden Gate Park. Wander through the museum’s spectacular permanent displays of paintings, sculpture and artifacts from the Americas, Africa and Oceania, and upgrade to include the audio tour and access to the top-tier Special Exhibitions. Head up to the Hamon Observation Tower to admire stunning views of San Francisco, Marin Headlands and the Golden Gate Bridge! The most-visited art museum west of the Mississippi, San Francisco’s de Young Museum houses a vast permanent collection of art in a distinctive copper-clad structure in Golden Gate Park. Exploring the museum at your leisure, marvel at important American paintings, sculptures and decorative objects from the 17th century to the present, as well as fascinating pottery, woodcarvings and other decorative objects from South America, Africa and New Zealand. Delve deeper by touring the museum’s rotating exhibits of photography, textiles and graphic arts. The collection includes Japanese prints, photos of the aftermath of the 1906 San Francisco earthquake and couture designs by Christian Dior and Coco Chanel. Recharge at the de Young Café, offering views of the museum’s sculpture garden and menu items tied to the themes of current Special Exhibitions. Browse the intriguing selection of publications, home goods, toys and crafts at the museum’s stores, and don’t miss the views of the Golden Gate Bridge and Marin Headlands from the 144-foot-tall (44-meter) Hamon Observation Tower. Enhance your de Young Museum experience with the fascinating audio tour, suitable for both adults and children. Or you can choose to enjoy entrance to the highly anticipated Special Exhibitions, a staple at the de Young. Past exhibitions have showcased masterpieces by Picasso and Van Gogh, provocative costumes by designer Jean Paul Gaultier and priceless ancient Egyptian artifacts from the tomb of King Tut.